The following story was sent in by Elijah, a 3rd grade homeschooled student in Texas. We're pleased to announce that Elijah has won the prize for the younger students in the writing contest! My family often goes to South Padre Island at the very tip of Texas. Of course, we go to the beach and build sand castles and play in the water, but we also spend a lot of time birding. On a nice evening in May 2008, after playing at the beach, we decided to go to the boardwalk to bird. We did not know it, but we had picked a great evening to bird. Usually there are not many people there, and we never see more than about thirty birds. Imagine our surprise to see lots of people and hundreds of birds. My family was still fairly new to birding, so we were not thinking about spring migration. Birds were everywhere, and they did not care how close people got to them. They were returning to their nesting grounds and had already flown a very long way. All these birds had flown across the Gulf of Mexico without stopping. They could not stop to eat or sleep or even rest, so they were very tired. South Padre Island was the first land they saw. It seemed that they just fell out of the sky. I bet they were happy to find food and to rest. We were very excited to see all these different birds, but even with our field guides, how could we figure out all these birds’ names? Well, some very nice birders let us follow them around, and they told us the names of all the birds. We wrote them all down, so we could study them in the field guide later. We added 21 birds to our life list that day. Now, I will tell you the best part, something that I could have never imagined would happen. I spotted a very pretty bird with red and yellow on it. 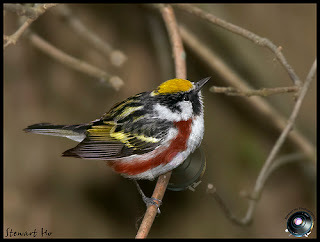 Our new friends told me it was a Chestnut-sided Warbler. I squatted down beside him to see what he was doing. He was eating a few ants. When I got closer to him, I accidently stepped on the ant hole. This stirred them up. The bird started eating the tiny black ants as fast as he could. Next, I reached out and touched him. He just kept eating. I have never before or since been able to get close enough to touch a wild bird before. I guess all the birders thought it was neat to see a little boy so close to a little bird because they took lots of pictures of us. We were definitely at the right place at the right time that nice evening in May. 1. Start your own Birding Life List. Record the names of all the birds you see and when and where you see them. 2. Find out more about stop-over habitat and why it is so important to tired and hungry migrating birds. Do you have any places near where you live where birds hang out in large groups? We were very happy to receive touching, funny, and terrific stories for our writing contest. As a quick reminder, the topic was - What is your most exciting real-life birding experience? It was difficult to select the best story from all the great submissions, but we are proud to announce that 6th Grader Chloe is our grand prize winner in the "older kids" category, with her story about one brave bird. The winning story in the "younger kids" division, and some of our favorite runners-up will be posted soon! Thank you to all who submitted. Winner #1 BirdSleuth Writing Contest Entry! I’ll always remember the day I fed my first bird. Well, I didn’t exactly feed it from my hand, but still, I fed it. I had always looked at books with people holding seed in their hand while a chickadee or a nuthatch was eating the seed. I had seen and heard enough. I was tired of seeing pictures with a bird feeding from their hand, so I decided to try it myself. It was September 26, 2011. In the past few days, when I had gone outside to fill up our seed feeders next to the hummingbird feeder, a female Ruby-throated Hummingbird would always dive down to the feeder to try and drink some sugar water, but would always fly away when she saw me. I saw how bold she was, and that afternoon, I decided to try my experiment. It was around 3 pm. I changed my gray shirt and put on a red one. I walked outside next to the hummingbird feeder and stood there. I looked around for the female Ruby-throated Hummingbird. After a minute or two, I saw her sitting in the dogwood tree nearby. I picked up the hummingbird feeder, put the hook around my finger and held it. I waited for about a minute. My finger started to hurt, but I wouldn’t put the feeder down. I couldn’t give up yet. After about five minutes, she flew down, but didn’t drink the sugar water. She flew to another dogwood. After a few more dives, I started to say to her, “please don’t be afraid of me,” and as if by magic, she flew down to the feeder and drank the sugar water! “Thank you,” I said, as if she could hear me. Maybe she could hear me. I kept calling her Fearless, and when I called, she would always fly down to the feeder. Sure enough, the next morning I went outside and called Fearless, and there she came. I fed her two more times to make it thirteen times I had fed this hummingbird. I wish I could have fed her more, but since Ruby-throated Hummingbirds are very territorial, I knew I would not be able to feed her much longer. That afternoon, I went out to feed Fearless, but the hummingbird that was outside was not Fearless. Fearless had tried to drive off another hummingbird, but she had lost the battle. I was sad. I knew the other hummingbird would not drink from the feeder while I was holding it because she would not even try to drink while I was outside. That was the end of my hummingbird feeding adventures. 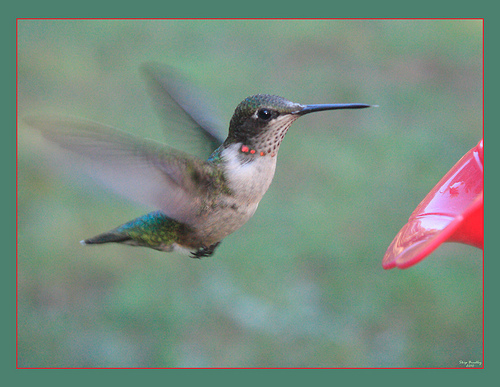 Next year on September 26 and 27, I will go outside and try to feed a hummingbird, and maybe it will be Fearless, the Ruby-throated Hummingbird. Thanks Chloe for sharing your amazing story with us. Check out this link to All About Birds to learn more about Ruby-throated Hummingbirds; specifically, be sure to check out the videos: http://www.allaboutbirds.org/guide/ruby-throated_hummingbird/id. As you watch the video, try and focus on the wings of the Hummingbirds as they fly. Hummingbird flight is different from most other birds: they have very strong breast muscles which allow them to flap their wings incredibly fast - often too fast to see. Plus, their wings attach to their bodies only at a single point near the shoulder joint - this allows the wings to rotate like a figure 8. These fast, versatile wings let hummingbirds fly forwards and backwards AND hover in mid-air! Now, imagine seeing it up close, and hearing those tiny wings buzzing like a bee! Awesome! We encourage everyone to keep an eye out for these acrobatics of the air; but keep in mind that hummingbirds migrate out of most locations in Canada and the northern United States. 1. Use eBird (www.eBird.org) to learn which hummingbird species live in your area and when they are found there. 2. Find out more about flight and how hummingbirds are unique. 3. Build your own bird feeder or purchase a hummingbird feeder so you can feed birds! 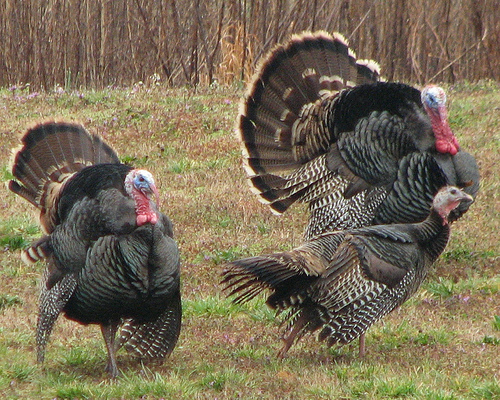 Welcome to the BirdSleuth for Homeschools Blog! We want to encourage our BirdSleuth students to think about their own birdwatching experiences. As you've probably seen in a previous post, we're holding a contest for students to write in about their favorite bird experiences (entries are due December 15 and there are prizes!). Maybe it seems like a challenge to think about birding in this way? I'm hoping to inspire you by share one of my favorite bird experiences with photographs =). Before I share one of my favorite birding stories, it's only fair that I give you a little background about me. I'm a senior in college at Cornell University, and really interested plants and communication (no, I don't mean communicating WITH plants). I mean, I've been very interested in communicating ABOUT science, which is why I am an intern for BirdSleuth. In the scientific community, I think that birds are one of the best things to communicate about. They're an incredibly important part of the environment, and they are really cool: they can fly, and they have so much diversity! It's no wonder that so many people devote their careers to studying birds. But as I said, as a student, my interests have always been focused on plants (perhaps because it's easier to study something that doesn't constantly try and fly away). It's because of plants that I found myself in Argentina my sophomore year of college. A group of students and I were studying the desert plants of South America - little rough, spiny bushes that live in one of the hottest, driest places on the planet. You'd need to be a plant person to want to deal with this these thorny things ... or so I thought. Along with us plant people was a small contingent of birders - they studied the plants too, but they were in Argentina for the birds. It was my first experience dealing with these passionate people, and I hadn't seen anything like them before. They always had binoculars around their necks, and were never more than a few feet away from their cameras with ginormous telescopic lenses. Every time they saw a bird, it was like an achievement, even if they'd seen that species before, and they spent so much time taking page after page of notes about these birds. It was incredible. The most curious thing, though, came on a stop in a small inland town. We had the morning off, but it was a scorcher - hot, dry, and uncomfortable. We heard rumors of a delicious ice cream shop somewhere in town, and my plant friends were determined to find it and eat ice cream in the shade. The birders, on the other hand, had a different destination for that morning: the town dump. You can call a dump a lot of things - a land fill, a recycling center, a garbage heap - but on a hot day, it's always going to be a dump. Why did they want to go to the dump?! And why did my plant science professor want to go too?! Knowing that I could get ice cream anytime back home, and that perplexing questions bother me, I said farewell to my plant friends and went to the dump. As expected, it was hot, smelly, and dirty. There was no shade, no ice cream, and no relief. There was water - a big pond of sludge and garbage. And there were birds - gulls and a few other species that I had seen in the desert - but nothing else to speak of. Why had I come?! I could have been partaking in ice cream in the shade! As I stumbled around the dump, trying to avoid the worst garbage, I saw the birders stop up ahead - I thought it was a flock of gulls or something else, so I didn't rush to catch up. But, they stood there for a long time until I had caught up and seen the most amazing thing: flamingos! Flamingos are generally interesting animals - they have long legs so they can wade in shallow water. Due to their diet, they have bright pink feathers, and the pinker males are the most favored mates. Some species filter feed on brine shrimp and blue green algae - cool stuff! But, the reason this is one of my favorite birding memories is because of the number - not until you see hundreds of flamingos wading in the mudflats of a hot, muggy dump in Argentina do you really appreciate how social birds can be. We stood there for a while, watching the flamingos move around, dunk their heads under water, and then fly away when we got too close. All I can say is ... flamingos were a lot better than ice cream! That much, I am sure. So, it's no wonder that when I we stopped in at the next town, the birders and I were at yet another dump. There weren't any flamingos, but I saw some pretty cool hawks. Who knew that landfills were such great places for birdwatching?! Homeschoolers are probably our most connected and socially networked participants. We imagine you belong to several email lists, regularly check online forums, and probably have many friends who also homeschool. We'd greatly appreciate it if you could share about BirdSleuth and Cornell Lab resources to your friends and contacts. We'd like to help more people discover the things we have to offer! Where should I share? The possibilities are varied! Facebook; blogs you write for or follow; your email contacts; lists you are a part of; your state, local, or regional homeschool lists or newsletters. Think about the places where you get information... and the people you could share this information with. Here’s the November Share-Athon Challenge—create a message about BirdSleuth and share it. Then, simply let us know who you share it with by emailing us (birdsleuth@cornell.edu). Let us know where you shared it by December 1 and you will win! Share it in one place and you’ll receive a free copy of our kid's research magazine. If you share it in two or more places, we’ll send you up to 10 copies of our kid's research magazine to distribute and use—just let us know how many you want. Here’s the fun part—whoever shares the word with the most places will get a prize pack that includes any one of our BirdSleuth kits, a “Diversity of Life” CD, and a set of picture game cards (approximate value of prize: $125). So, please help us pass the word—it’s easy—and you could win a great prize! Finally, on this Thanksgiving eve, I'd like to wish you and your family a happy and safe holiday together. The Wild Turkey was an important food source for Native Americans, but it was eliminated from much of its range by the early 1900s. Today, programs have reintroduced this species most of its original range. You can learn more on All About Birds! Thanks to Vicki's Nature (Flickr) for the photo. What is inquiry... and how does it fit so well with homeschoolers? When I first was hired at the Cornell Lab, they told me to create an inquiry-based curriculum. Hmmmm... I started by asking myself and my team: WHAT IS INQUIRY? First, it's not the same as doing "hands-on science." I came up with my own personal definition: it's when someone asks and answers his or her own questions. Therefore, it's based in personal curiosity and investment in the answer. Science is, by its nature, inquiry-based. Inquiry implies ACTION on the part of the learner: a search for information; a pursuit of knowledge; the exploration of phenomena in order to better understand the world. To accomplish this, learners need experiences with objects, phenomena, and/or nature that will stimulate thinking and raise questions. Opportunities for active investigations that include gaining knowledge and skills through observing or manipulating objects, phenomena, and/or nature. One easy way you can incorporate inquiry into your teaching is simply to reconsider how you ask questions and how you provide opportunities for your child to think or puzzle things out. For example, take the photo on the right. You could state: "Sam, that is a Rock Pigeon." By "giving it away," Sam is left with memorizing the bird's name--or not. Or you could pose a question: "What kind of bird is that, Sam?" That question is a good start. Sam can look up the bird online or in a field guide if he doesn't know it. By figuring it out, he's learned that he CAN find answers... and also, how to go about it. What is that bird is doing? Why is she doing that? 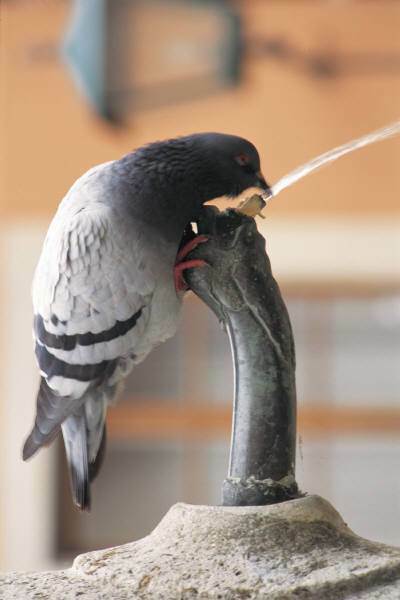 Where do birds usually get water? Does it depend on the species? 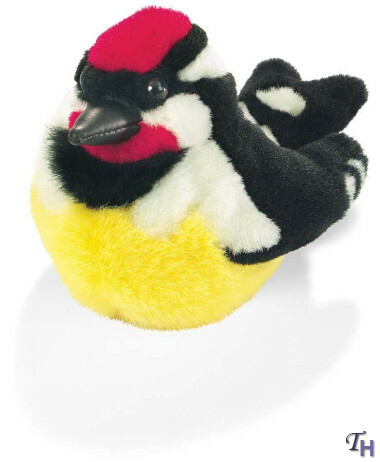 What kinds of things do you think this bird has to do to survive in her habitat? Take a moment to help me brainstorm some open-ended questions and add them to the comments section of this post! By the way, one of the curricula modules we ended up developing is a truly inquiry-based resource called BirdSleuth: Investigating Evidence. It's available for a free download. It invites kids to collect their questions on an "I wonder board." This approach has worked so well, I hope you'll give it a try! Yesterday, I shared one of my favorite birding experiences. Now, we'd like to invite BirdSleuthing homeschool students, ages 5-15 years old, to share theirs and enter our contest! The topic for this writing contest is: What is your most exciting real-life birding experience? We want to hear about your most interesting memory that involves birds or bird-watching! Your story only needs to be 500 words or less. (That means less than one page. Illustrations are welcome but not necessary. If you include a photo, make sure it is not copy-righted.) Please use our online submission form to send us your creative story. I look forward to reading your story, and look forward to sharing the best story on this blog! The deadline for the contest is December 15. We'll post the winning entry before we leave for winter break! PS: Besides having their story published here, the winning student will also receive five gifts from the Cornell Lab of Ornithology: a plush Yellow-bellied Sapsucker, a "Diversity of Animal Sounds" CD, a set of BirdSleuth Game Cards, a field guide to backyard birds, and 2 issues of Classroom BirdScope. and this one plays our real calls if you give him a good squeeze. I'm not a "bird expert" like many of my colleagues at the Cornell Lab of Ornithology, who can identify most birds by hearing a snippet of their song or catch a brief glimpse of a species flying away and name it. However, I do enjoy watching birds--they are the part of nature that I find most fascinating. In my job, I'm really interested birds as a way to interest children in the outdoors and engage them in science. I also think the Cornell Lab's citizen science projects--like eBird and Project FeederWatch--are a great way to get involved and turn an interest in birds into something meaningful and important. Last February, I had the pleasure of going to Nassau, Bahamas to participate in a Caribbean WaterBird Monitoring workshop. There, I had one of my favorite birding moments: for the first time, I knew that I had the tools I needed to figure out what kind of bird I was looking at--even if I'd never seen it before. The best part was the excitement I felt at identifying birds; it felt like a sport: something I could get better at--my own personal competition! Shore bird with pink legs? 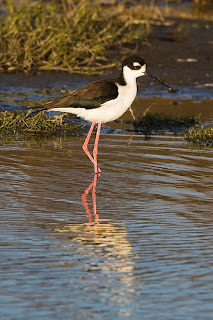 Black necked Stilt! Black swimming bird with a red beak? 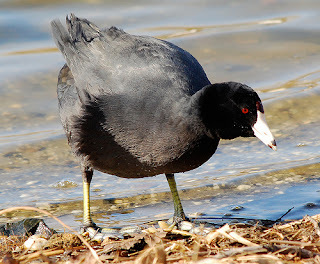 Common Moorhen! And I knew not to confuse that stilt with any of the similar plovers or sandpipers we saw... nor to confuse the Common Moorhen with the similar-shaped-and-sized waterbirds we saw (like coots). I knew my field marks, was getting better using my field guide and binoculars, and I was remembering the names. Later, when we played Bird Jeopardy (Jeopbirdy, anyone? ), I felt confident in my abilities, and I enjoyed going head-to-head with other participants in a race to identify each species as quickly as we could. Yes, my team won! And I learned a valuable lesson--that a beginning birder can learn new birds quickly...and doing so was fun! Lastly, get out there and notice the birds in your neighborhood! Bring science to life through birds, citizen science and backyard investigations.